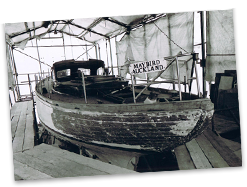 The restoration of Maybird began to take shape during 2006. Transporting her from Keri Keri, New Zealand to Saxon Wharf, Southampton is an interesting tale of logistics and bureaucracy. 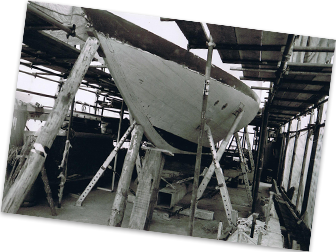 Maybird arrived back in the UK in July 2007 and resided on the River Hamble whilst we agonised over whether to give the job to a boatyard or whether to put a team of craftsmen together ourselves and essentially undertake the project on a ‘diy’ basis. 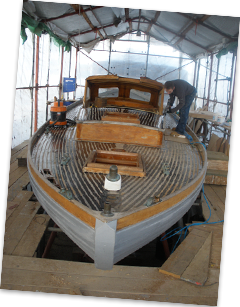 Being a ‘hands on’ sort of crew with a really knowledgeable wooden boat surveyor, Adrian White (www.adrianwhite.co.uk), at our side, we chose the latter option. 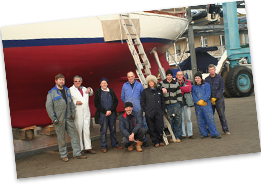 Our first challenge was to find a suitable shed for a couple of years and to put the team together. Over copious cups of tea and coffee at the Lulworth Café, on the River Hamble, the nucleus of the team was formed. We would use Graham’s shed at Saxon Wharf, Southampton. 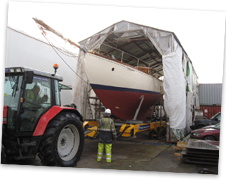 Maybird was lifted ashore in March 2008 and the strip out commenced.